The New Year got off to a confusing start for both fisherfolks and seatrout. This winter has so far given us relatively mild temperatures, and the few cold fronts that have gotten the air temperatures down have been short-term and haven’t resulted in getting the water temperatures down to drive the trout in large numbers into the river for an extended time. It’s made for more comfortable but inconsistent fishing. 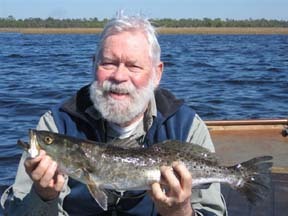 Not that there weren’t some large trout around; Phil Horn set a new Gainesville Offshore Fishing Club record with this 6.9 pound trout caught on a Catch 2000, breaking a record that had stood for almost 15 years. We found some large trout outside of creek mouths, but they weren’t in their usual schooling behavior that we look for this year. On one day after the air temp dropped to the high ‘20s for two days, the water temperature was still in the high ‘50s, unchanged from the week before. 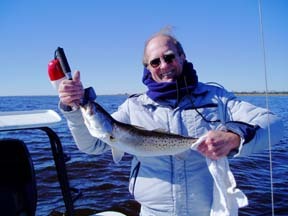 The river trout, like this one caught by Russ Roy, were scattered and mostly smaller slot-sized fish. 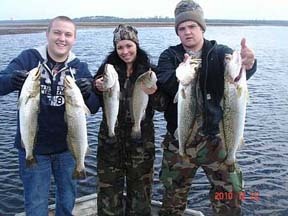 However, we have the newly opened season in February to find the fish, which is a great advantage. Offshore, we’ve seen some great catches of black sea bass, Florida snapper and red grouper. 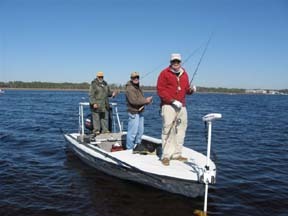 Some of our inshore guides with larger boats have been targeting the tasty bottom fish with great success. Lots of action, and great eating for those that can get to 20 feet of water. Sheepshead have also been available in decent numbers, ahead of schedule this year because of the warming trend.